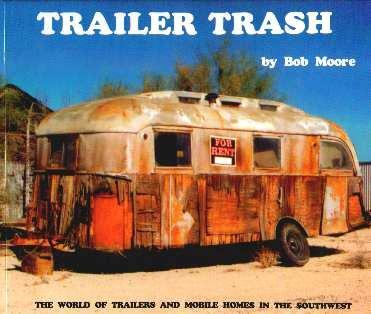 Here's a fun book for anyone interested in trailer living. Author Bob Moore has compiled a novel collection of early mobile homes (really trailers) and the fabulous print ads for them at the time. They really were on wheels, and to me, look precariously balanced to say the least because they were built to be moved around from place to place as one's needs dictated. It's a lovely collection of the 50s and 60s trailer culture that sprang up and thrived. Parks were built to accommodate these "homes" and by all advertising accounts, they looked like little homes and suburbs. Some ads even featured floor plans to tempt the buyer, as well as being fitted with applicances, into purchasing one. Over the years the sizes and shapes changed, some even becoming bi-level - trailers ranged between being 8 feet and 10 feet wide and 35 feet and 52 feet long. This is an unusual book and an interesting aspect of Americana - a bygone way of life which should be documented even though Bob's pictures are of abdandoned homes. Nowadays "mobile homes" are stationary structures but are sometimes referred to as "trailers" - Why? Nostalgia? Conclusion - Great Americana and rather fascinating.